If you’re a long term reader, you probably know my background is… well… on the ‘varied’ side. That’s putting it kindly. It’s a result of my short attention span and a total intolerance of boredom, I think. Quitting was more of a hobby for me, rather than the last resort most people treat it as. That was in my days as a yoof, of course. I’m a little (only a little…) better now. The benefit of it, though, is that that ‘varied’ background leads to some pretty interesting convergences. Right, now, I’m working on one of them. A project that came to me through an old university job contact, that resulted from my podcasting work now, and that stayed because of the web design and marketing experience I can bring to it. And it’s something that I’ve suddenly realised will be useful to you as well. There are some great tools involved. Cue…. blog post! The project seems a bit dull on the face of it: audio & text material, as part of a course which is delivered by email. It helps care home staff get better at their jobs. Thing is, it’s far from dull – I’m actually finding it pretty fascinating. Also, bloomin’ effective – the staff are loving it as a new way of growing their skills. Just another way Podcasting can help people. I wanted to share the approach we’re using for this, because it’s a relatively unique combo of tools and techniques. Plus, I know that this approach can work for anyone, in any niche, who’s got something to teach. It can lead to a really engaging free course to share with your audience and build loyalty (email optin? Free gift?). Or, it can form a course you sell to others. We’re charging mid-4-figures to create this for an Edinburgh based company. Businesses value online teaching materials! The aim of this approach is to create an online course that’s ridiculously easy to take part in. Even for people who don’t know how to hold a smartphone the right way up. It strives to be stupidly simple to take part in, for anyone. That means avoiding tools like Teachable and it’s ilk, as good as they are. Logins and new systems are barriers for a lot more people than you know. That means aiming for brutally simple, and keeping it all within the tools that people already know and love. Let’s cover format first. Get it out of the way, before we dive into tools. It’s the important bit, really, determining whether your learners will take part. And keep taking part. A really effective learning method (particularly online) is short, sharp lessons on a super-regular basis. For example, take a 2 week course, which includes 10 lessons of 20 minutes each, delivered every weekday. It’s easy to fit in (coffee-break learning) and builds a habit of doing it every day. Both elements are important. The short time commitment reduces the initial barrier to take part, and that, combined with the super-regular rhythm, builds the habit of participation. Next, it needs to include a task. Our 20 minute lesson, every day, is split into 10 mins of consumption (listening, reading, watching) and 10 mins of doing. As them to DO something with what you teach. This is based on age-old research – it’s related to a concept called constructivism – which basically means that we learn things really well when we put them into action. Consumption on it’s own isn’t enough. Lastly, the ‘doing’ needs to be meshed into their real life. That means giving your learners a task that actually achieves something in their work. For example, take a Twitter marketing course. Lesson 1 might be titled “Create a Better Bio”. Your teaching offers a range of tips, and your task asks them to put it into action. By the end of the activity they’ve made real-life progress. They’ve got a nicely polished bio, live in the real world. It’s not just theory. For bonus points, get them to feed back. As them to write in a forum or a group about how they found the task. Ask them to share their results. If you can encourage a bit of conversation around their learning, this really builds on the effectiveness of the doing we triggered earlier. This turns constructivism into social constructivism, and helps people to learn even more effectively. Don’t worry, I didn’t just make this up. Everything about this format is based on a huge amount of research on learning science. It’s what did my PhD on – how to teach better, online. It really works. If you’re a teaching geek like me and you’re interested in the background material, get in touch, and I’ll send you a copy of the book. If we’re dedicated to keeping it truly simple: everyone who’s online has email, at least. So, this is where each lesson starts. I send an email to the learner every morning. It has everything they need: an intro, a summary of the learning, a link to that day’s media (a podcast or a video) and a description of the task. The key here is that’s all they need, but it has extras if they want. Click the link and they’re sent to the blog for the media, or to have a chat about the task in the comments. Either result ramps up engagement if you can encourage it. You can do this for free if you’ve got a small list and don’t mind a manual approach, either on your own email or with Mailchimp. I use a paid tool, Convertkit (affiliate link, but it’s awesome! ), because of the automation it offers. It’s designed to deliver courses or sequences like this, and the power it gives you is worth every penny to me. You need a website for that 2nd level of engagement. It has a blog version of the email text, and includes an audio or video version of the lesson. The media helps to increase engagement with the course, and allows every learner to choose their own medium. Some prefer to listen, and others to watch. The blog comments are also important, for me. I try to get people feeding-back on every task, and blog post comments are super-simple. They let people get involved without the hassle of logins and accounts. 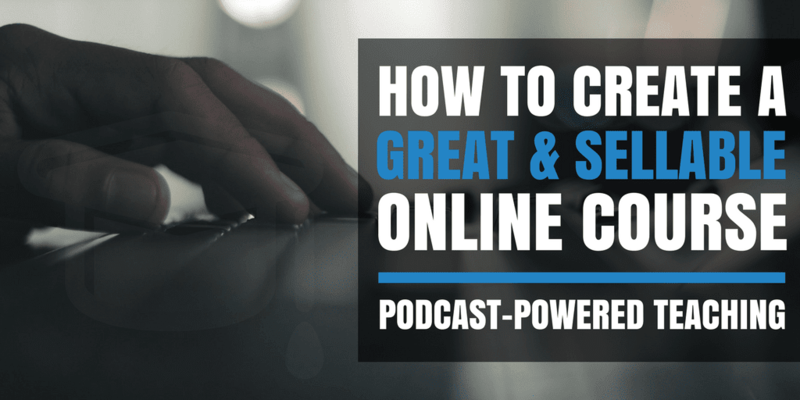 Setting up a simple blog (and a podcast on it) is shockingly easy. Check out our Podcasting Websites course to learn how. Podcasting really does work well in this. Your students can listen on the page (remember to keep it short!) or they can download and consume on the move (you go longer in this case…). Flexibility rules. Plus, with a lot of the staff we’re working with, reading isn’t their favourite thing. That’s the case with a decent portion of the general population. So, being ‘told’ the material really appeals to them. To make it easy to produce this material, get a mic that works on your Smartphone (iOS) OR your computer. That means you can record in any environment. I’ve talked about the MV5 a lot, but it’s big brother, the Shure MV51, is great for this. It comes with USB and lightning cables. It can even go on a boom stand when you set yourself up with a good recording space. I’ve been playing with Adobe Spark a lot lately. They recently updated the add to let you import video clips. With that addition, it can do practically anything you want. I’m good with their pro tool, Adobe Premiere, but Spark does 90% of what you need with 10% of the bother. And it looks better than I can create myself, half the time! Record a short clip on your phone and bring it into Spark. Then, chop it up and add some nice text transitions or voiceovers to highlight the key points. You can have a pro-looking 5-minute lesson done in no time. I hope it gave you some ideas. There are a lot of people out there looking to monetise their show, right now, and courses are a great way to do it. The problem is, they’re also an easy thing to screw up. 90% of courses out there are rubbish. They’re generic, un-inspiring and, worst of all, generate zero action or success. How many times have you signed up for an online course and never finished it…? Or… never even started it! The best way to create a successful course is to create successful students. And for that you need action. Action-taking students act as proof of quality. They’re the evidence the course works. They also act as evangelists! If you can help someone succeed, they’ll shout about it. This approach isn’t the only way to push people to succeed, but it’s definitely the most effective way I know. Short, sharp lessons, involving real-life action and delivered on a super-regular basis. That inspires progress and success. Give it a shot: try a 5 day course to start with. Teach something you know well. Keep it short, keep it simple, keep it active. Let me know when it works.